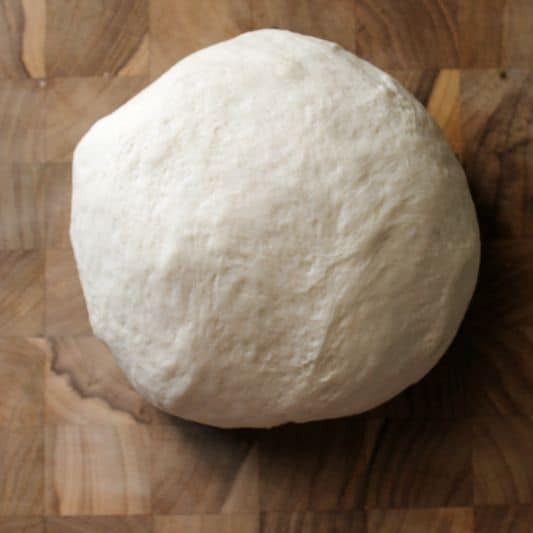 Pizza is a staple around my house, and with this Homemade Pizza Dough Recipe, it’s easier than ever to make any pizza we can dream up! I love pizza. Like L-O-V-E pizza. There’s a million and five ways to top ’em. They can be sweet or savory, and for breakfast, lunch, or dinner. It’s a carboholic’s dream. So get ready to make all your pizza fantasies come true. It just takes a little dough and your imagination! This dough does take some time since it needs to rise twice, but if you get it going in the morning you’ll be all set for lunch or dinner that night. You can make the full recipe, cook one half of the dough for dinner and put the other half in a Ziploc bag in the fridge for a couple days so the dough is ready to go. (But make sure the bag is big enough – no exploding dough in fridge surprises here thank you very much.) Make your life easy kids. I’ve made this dough countless times, and it comes out great every single time. I even used it to make my Pizza Muffins & Cinnamon Sugar Cheesecake Bombs! 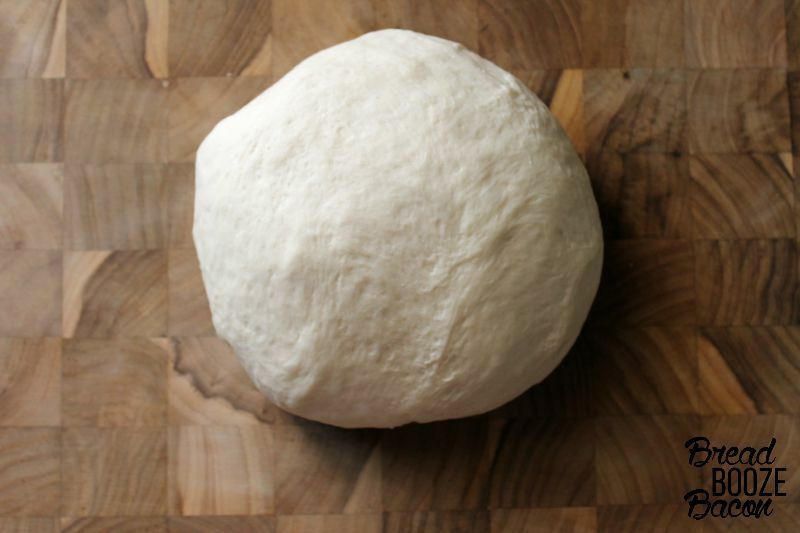 Pizza is a staple around my house, and with this Homemade Pizza Dough recipe it's easier than ever to make any pizza we can dream up! Add yeast to warm water and give it a quick stir. (I leave everything in the measuring cup the water's in.) Let sit for 5 minutes so the yeast can bloom (see: bubbles). In the bowl of a stand mixer, add the flour and salt. Using the dough hook attachment, stir together the flour and salt. Add the yeast mixture to the flour mixture, being sure to get all the yeast out of the measuring cup - use a little extra water to rinse and pour if needed. Turn the mixture to stir until the dough starts to come together a bit, you don't want flour flying everywhere. Increase the speed to low / medium-low and let the mixer do its thing for 2 to 3 minutes. If you notice the dough looks dry, more water as needed until the dough starts to stick together. (My dough is always dry, maybe it's an AZ thing. I end up adding 1/4 to 1/2 cup more warm water to the original dough recipe.) In contrast, if the dough gets too wet, add flour 1 tablespoon at a time until it's not as sticky. The dough should be in the mixer for about 5 minutes total once you increase the speed. Once the dough has formed a ball-ish shape, turn it out onto a clean work surface that's been dusted with flour. 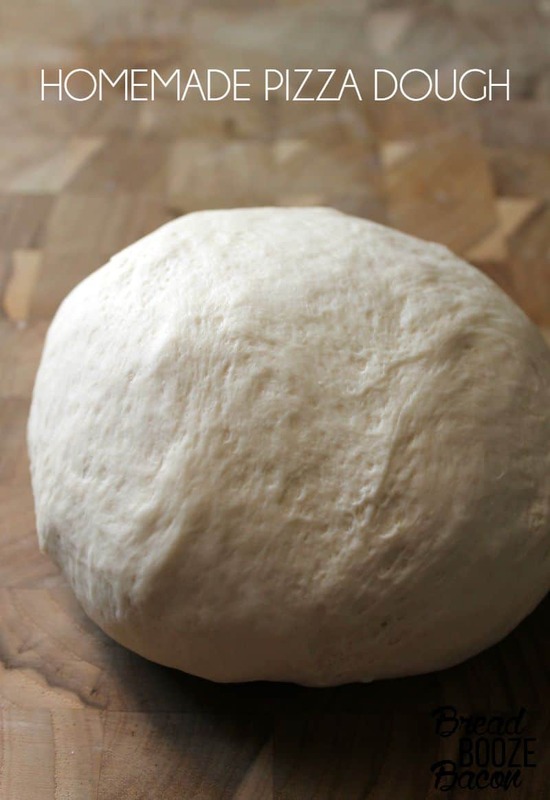 Knead the dough by hand for 5 minutes, until the dough is evenly moistened and forms a nice ball. Coat a large mixing bowl with non-stick cooking spray (or lightly with oil). Place the dough in the bowl and roll it around to coat the outside of the dough in oil. Cover the bowl tightly with plastic wrap and let rise in a warm place on the counter for 2 hours, or until the dough has doubled in size. Unwrap the bowl, and punch down the dough. Cover to bowl with a tea towel (see: kitchen towel) and let it rise for another hour. Punch down dough one more time, divide it in half, and get cooking. 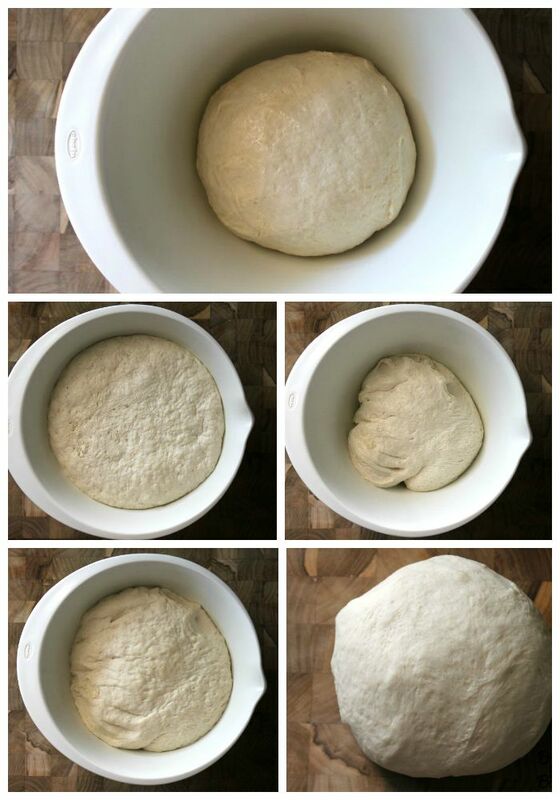 For a thinner crust, let the dough rise once for 1 hour and use immediately. If you don't want to use your dough right away, place it in an air tight container (with room for the dough to rise, because it will) and store in the refrigerator for up to 2 days. 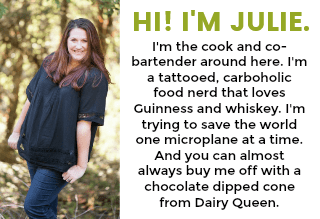 What do I use if I don’t have a stand alone mixer? You can mix the flour, salt, and yeast mixture together in a large mixing bowl with a wooden spoon. Once the dough begins to come together, turn it out on to a work surface, and knead for 10 to 15 minutes minutes until it comes together and become elastic.